(Photo: REUTERS / Nigel Roddis)Women react after the Synod session which approved the consecration of women bishops, in York July 14, 2014. The Church of England voted on Monday to allow women to become bishops, a historic decision which overturns centuries of tradition in a church that has been deeply divided over the issue. The Church of England has voted to allow its first ever female bishops 20 years after it ordained its first women priests. The decision Monday reversed a previous rejection in 2012 and comes after intensive work by the Archbishop of Canterbury, Justin Welby with church lay members being the stumbling block. "Today is the completion of what was begun over 20 years with the ordination of women as priests," Welby said. "I am delighted with today's result. Today marks the start of a great adventure of seeking mutual flourishing while still, in some cases disagreeing. 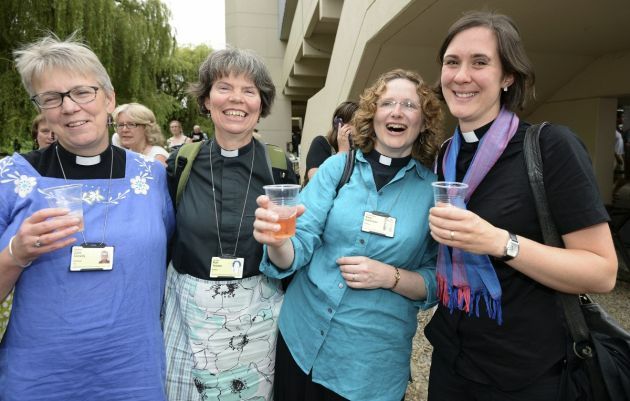 Women can serve as bishops in other Anglican Communion churches in countries such as Australia, Canada, Ireland, India, New Zealand, South Africa, Swaziland and the United States. The Church of England ordained its first female priests 20 years ago. "As delighted as I am for the outcome of this vote I am also mindful of those within the Church for whom the result will be difficult and a cause of sorrow." The new measure contained concessions for parishes that continue to object to the appointment of a women bishop and it gives them the right to ask for a male alternative and to take disputes to an independent arbitrator. There were cheers in the hall at the Church of England General Synod in York, northern England on Monday, as the measure passed after five hours of debate. The measure had the backing of British Prime Minister David Cameron along with Welby. The Archbishop of York, John Sentamu, said, "This is a momentous day. "Generations of women have served the Lord faithfully in the Church of England for centuries. It is a moment of joy today: the office of Bishop is open to them. "To those who ask 'what took you so long?' my answer is that every decision has a cost and there will be those within our body who will be hurting as a result of this decision. "We move slowly because we move together. But in moving together we achieve not only what is just but also model what is right." Sentamu who was born and grew up in Uganda said, "As the African Proverb says, "Whoever walks fast, travels alone. Whoever walks far, walks in the company of others." The World Council of Churches general secretary Rev. Olav Fykse Tveit expressed appreciation for the a historic vote by the General Synod of the Church of England. The vote will later be presented for confirmation by the British Parliament and will be received by Queen Elizabeth II in her role as titular head of the national church. "I ttrust that this decision will encourage women in the Church of England to use their gifts in all positions of Christian ministry to which their church now may call them," said Tveit. "The WCC member churches welcome the use of the gifts God has given to both men and women, and respect one another's traditions," said Tveit in a statement July 15. The results came in a series of three votes across different houses of the Church of England each needing a majority of two thirds. The House of Bishops voted 37 for, two against with one abstention. The House of Clergy voted 162 for, 25 against with four abstentions. The House of Laity voted 152 for, 45 against with five abstentions. Anglican sources said the first female bishops could be appointed before the end of 2014.